My brother and I started a Caps hockey blog. It’s called Brooks Laichyear and this initial post explains a little about it. Check it out and I hope you enjoy it. And thanks to all of you who have read my Caps post here on this blog. I imagine I’ll still be blogging here but that most or all of the Caps material will end up on BrooksLaichyear.com instead. 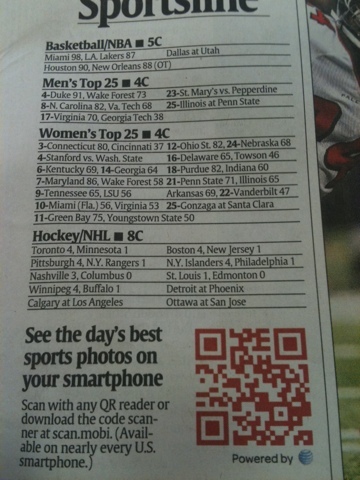 I like this use of a QR code in the USA Today Sports section.